This four-week workshop will teach you how to write horror that goes beyond the scares and beyond the gross-out, to compel, challenge, and move the reader. Where: Online — Available everywhere! There’s more to horror fiction than shock and revulsion. 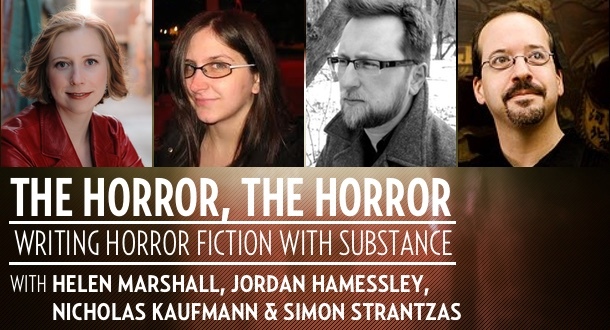 Over the space of four weeks, a quartet of today’s leading horror experts will take you through the elements that go into constructing a better horror story. The class will consider things like structure and pace, how to build suspense, strong character development, and the art of subtlety—all aimed at helping you to take your tales to the next level. And by the end, you’ll have a better appreciation of the tremendous possibilities horror fiction continues to offer the ambitious writer. Landing The Gut Punch: Structure, Pace, and Poe's "Unity of Effect"
LitReactor offers a unique approach to a writing education: You study what you want, when you want, at your own pace. We bring in veteran authors and industry professionals to host classes covering a wide range of topics in an online environment that’s interactive and flexible. You get detailed feedback on your work and take part in discussions in a judgement-free zone. It doesn’t matter if you’re a beginner or an experienced writer, our workshops are about working together to achieve your writing goals. Entirely online. So, anywhere you have Internet access. Are there certain times when the whole class needs to "meet" online? What does a typical class consist of? It varies, but nearly all our classes include weekly lectures, homework assignments, peer reviews, critiques from instructors, and discussion forums. How much experience do you need to take a class? Beginner or pro, everyone is welcome. We encourage all skill levels. Got more questions? Click here for an extended FAQ. And click here to explore a sample class that shows our layout and features.